Annka Kultys Gallery is pleased to present an exhibition of works by two London-based Danish artists, Stine Deja and Marie Munk. This is the first time the pair have worked together. Munk’s recent series of interactive sculptural works will be shown alongside Deja’s immersive moving image pieces. 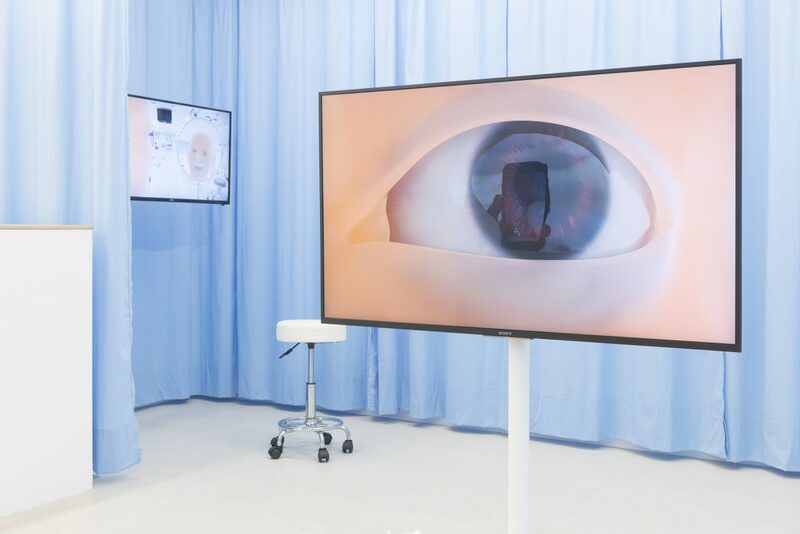 The exhibition, entitled Synthetic Seduction, questions and explores fundamental emotions, such as love, empathy, attraction and repulsion, within the growing importance of artificial intelligence in our everyday lives. “I wanted to learn what it meant to be a machine, or to think of yourself as such”, wrote Mark O’Connell, author of the 2017 meditation on transhumanism, To be a Machine. Conversely, can a machine learn to be a human? 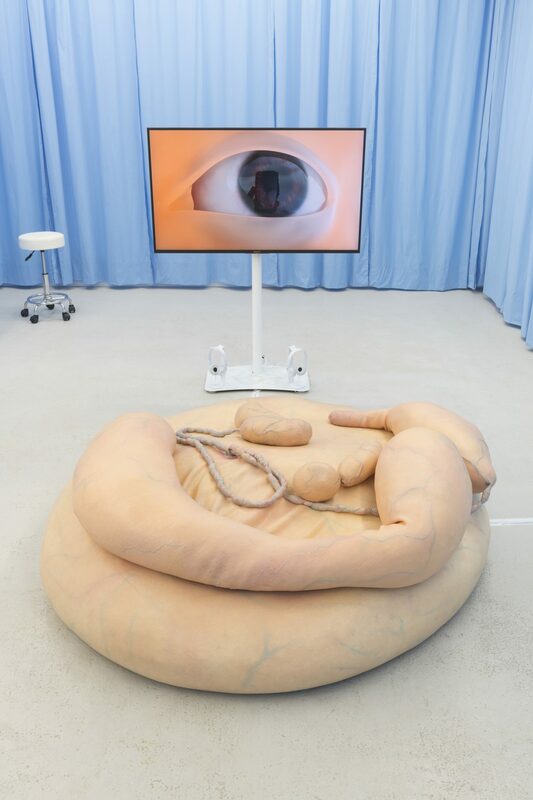 In a simulated laboratory setting, Marie Munk presents a recent series of sculptural work based loosely around an ambiguous aesthetic resembling in utero or newly born creatures, each work being animated in its own unique fashion through breathing, pulses, singing, speaking or moving. The works are interactive, and invite the gallery goer to touch them or lay down on top of them and feel them physically, while simultaneously watching Stine Deja’s video work. Looking and feeling like real organic material, Munk’s works can be seen as dystopian solutions for a digitally hyper-connected yet physically disconnected milieu. 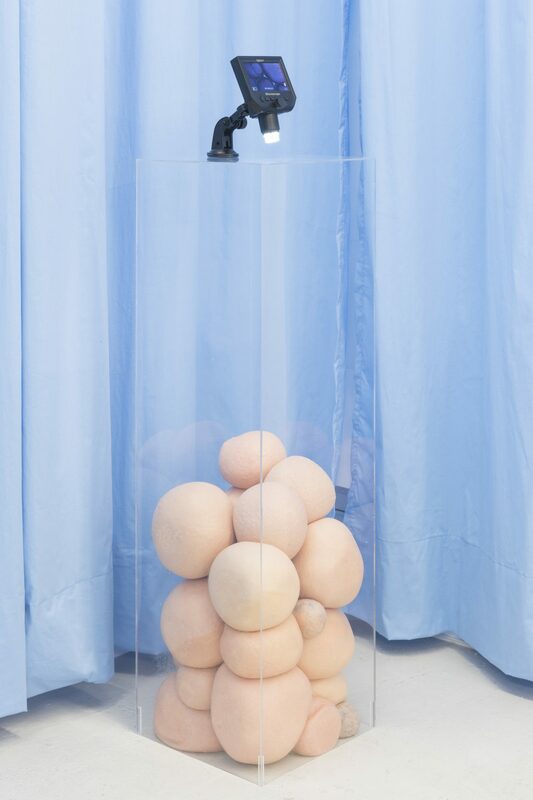 Toying with the human tendency to want to control nature and manipulate the self, the sculptures suggest substituting real intimacy for an artificial version of the same thing. Stine Deja presents the video Foreigner (2018) featuring an android singing “I wanna know what love is”, the 1984 hit from the homonymous 80s rock group, to himself in a vanity mirror. Immersed in a clinical environment, the android appears as a new born learning to experience emotion through a widely distributed and culturally ubiquitous musical touchstone. Drawing from algorithmic logic, the video satirises the ways in which machine learning recognizes patterns and repeats them regardless of what those patterns are while being a world away from actually identifying or knowing ‘what love is’. 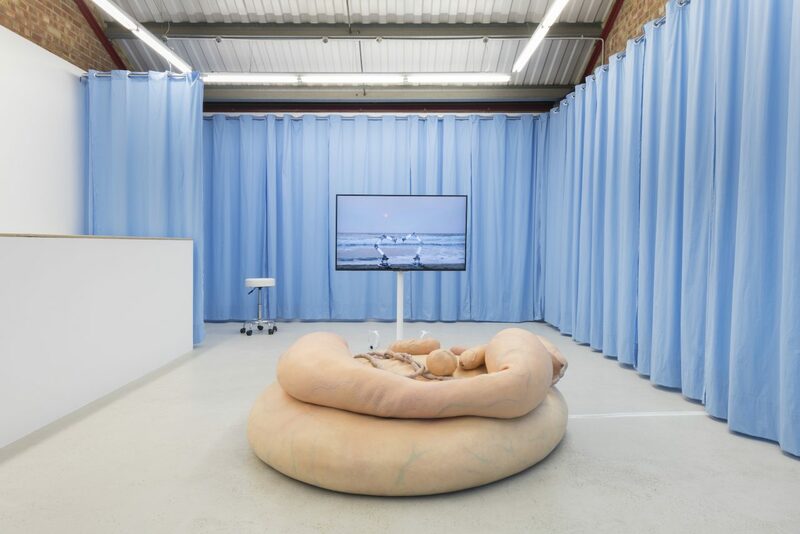 In a second video work, The Intimacy Package (2018), displayed on a large TV screen in the centre of the gallery, Deja has created a series of lessons, composed of five short sequences set in a variety of environments, such as a contemporary flat, a computer server room or an idyllic beach at sunset, in which an electronic narrator guides the viewer through various means of achieving intimacy. Employing romantic clichés from films, borrowing from conversations with Amazon Echo’s Alexa and sharing lessons from intimacy care workers, the film challenges how intimacy is realised and its inevitable failure when it is mimicked between human and non-human beings. 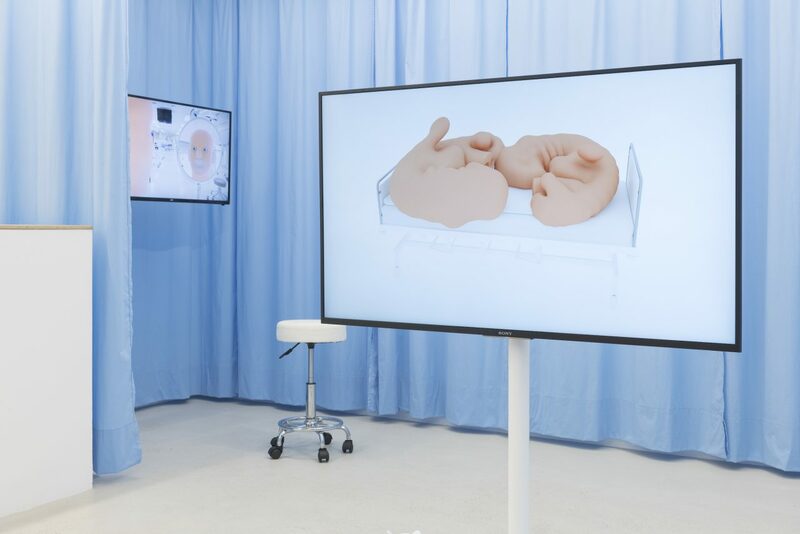 Synthetic Seduction explores how technology is striving to bridge the gulf of the uncanny valley (the notion that humanoid objects that appear almost, but not exactly, like real human beings elicit uncanny feelings of eeriness and revulsion in observers) to make personal devices as life-like as possible. 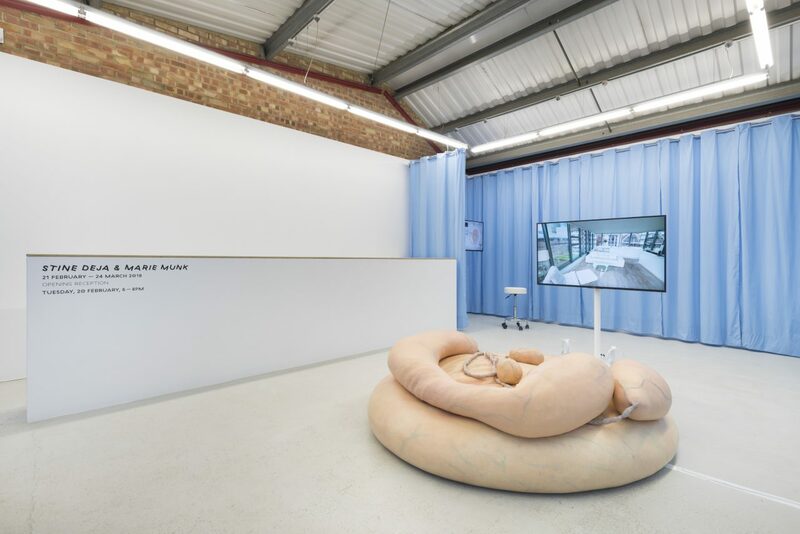 ‘Synthetic Seduction’ Installation views, at Annka Kultys Gallery, London 2018.